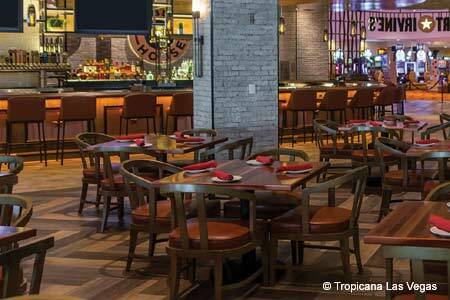 A fusion of seafood-centric Asian fare at Palace Station Hotel & Casino. About the restaurant & décor: Boathouse Asian Eatery was created by brother and sister team Cat and Tu Do with their partner Hans Mogensen. Décor features hand-painted art on white tiled walls, wood accents including a lattice ceiling and mahogany tables, an open kitchen and a large faux tree in the dining room. Likes: A plus for this seafood-centric restaurant is the fact that seafood is delivered six days a week and an aquarium houses live lobster and crab until they are ready to be prepared. Happy hour Monday through Friday from 3 p.m.-6 p.m. and 10 p.m.-11 p.m. offers dozens of starters and sushi rolls under $10, beer for $3 and well cocktails, house wine and saké half off. Dislikes: Some of the more authentic ethnic dishes may not be suitable for some American tastes, but those hailing from the countries of origin should appreciate their authenticity. Food & Drinks: The menu features representations from Chinese, Japanese, Korean and Vietnamese cuisine. Vietnamese dishes include clay pot catfish, Vietnamese-style egg rolls and sweet & sour catfish soup. Japanese renditions are a large array of nigiri/sashimi; hamachi jalapeño with yuzu soy; and rolls such as the Trainwreck with spicy tuna, shrimp tempura, unagi and spicy aïoli. Korean items are short ribs and kimchi fried rice. 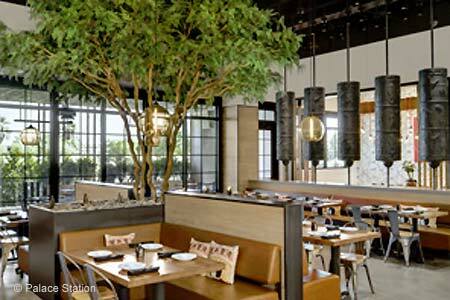 A large portion of the menu highlights Chinese fare, with selections like wok-fried Chinese spiced calamari; wok-seared filet mignon cubes with bell pepper and onion; and walnut prawns with creamy pineapple glaze and candied walnuts. A unique dessert is the corn flake-crusted deep-fried Oreos served with vanilla ice cream; while other more traditional Asian desserts include green tea, vanilla and red bean ice cream, and mochi in flavors of strawberry, mango and green tea. The beverage program encompasses Sonoma County wines, saké, Japanese whisky, Asian beer and artisanal cocktails such as the Buddha Fizz made with Hendrick’s Gin, lime juice, simple syrup and matcha powder.